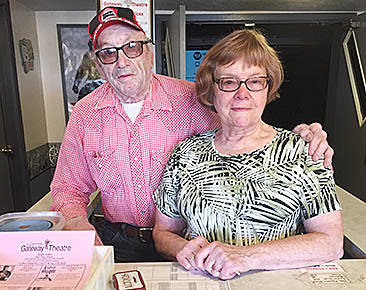 Pat and Flavian Luettel of Albion worked as Gateway Theatre supervisors for the final time on Sunday, May 14. After 14 years of faithful service, Pat, 88, and Flavian, 91, decided it was time to turn in their keys. Pat began volunteering at the theatre after retiring from Boone County Health Center. At that time, she was teased about changing from a paid to an unpaid position. After Pat and Flavian’s marriage in September 2008, Flavian began assisting her with the theatre duties. Pat has not only provided her services to the Gateway Theatre, but has also served as the manager of the Mission Possible Store for many years.